Depoe Bay has the distinction of being the world's smallest navagable harbor. This small and charming town is rightly famous for its whale watching and deep sea fishing. Keystone's Depoe Bay Condos provide the perfect (and luxurious!) getaway location. Both oceanfront and ocean view condos are available. Amenities include access to indoor pools, hot tubs, private balconies and a 19 seat theater room. Whether it is that long overdue first time visit to the Oregon Coast, a family reunion or simply a break from the hectic pace of modern life, Keystone Vacation Rentals has the ideal home awaiting you. If you are searching for a romantic getaway, this oceanfront corner condo located in Depoe Bay is that ideal destination! Known for romantic sunsets, 'Sea For Two' includes a cozy gas fireplace, HDTV's, king bed and a jetted bathtub. Located just a half block from Depoe Bay's unique shops and state park, Snuggle Up and Snuggle Inn are beautiful ocean view condos offering just the right amount of rest, relaxation and nearby activities to make your vacation one to remember. As you enter the Whaler's Suite, the wall-to-wall oceanfront windows will be the first indication your vacation has begun! Known for its whale watching and refined elegance the Whaler's Suite is a two bedroom luxury condo with amazing oceanfront views. 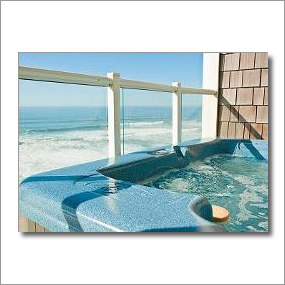 Enjoy amazing oceanfront views at a location known for its whale watching and tasteful elegance! Seacliff Loft is a one bedroom luxury condo featuring a river rock gas fireplace, a fully equipped kitchen and king bed in the master suite. Plan your visit to Depoe Bay. Depoe Bay Motels and Hotels.